This hasn’t been our most creative of Weekends. One thing we have sorted though is a proper home for this years runner beans and borlottis. Last year, fabulous though they were, they meandered up my well-intentioned, yet lacking in strength, cane structure. Once their mid-summer vigorous growth kicked in the whole thing started collapsing and remedial treatment was needed. So today, after our trip to the park, Ed created me a ‘bean thing’ with wood and bolts and stuff. 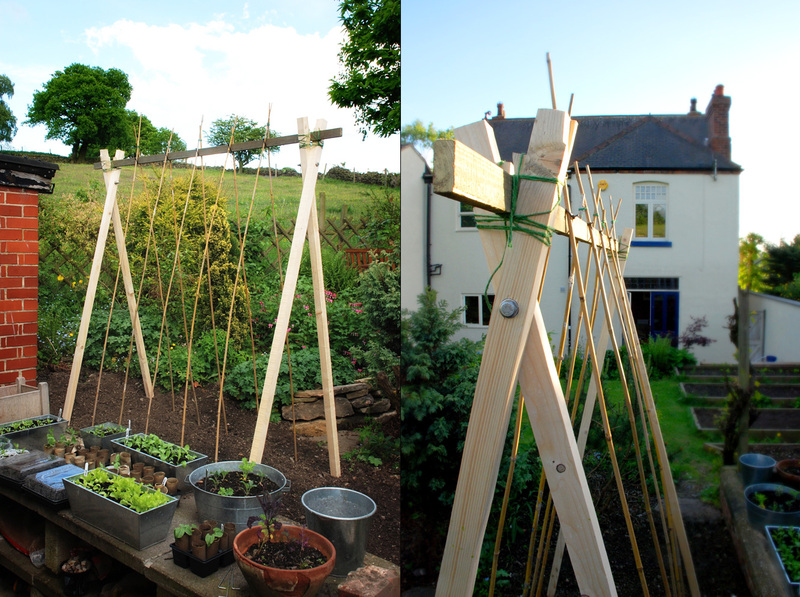 It may not be beautiful, but it will mean my legumes can climb in safety. The problem is…I forgot to plant any beans. P.S. I just looked out of the door and Ed and The Boy, who were supposed to be playing football, are both lying on the tree platform looking up at the sky as the sun goes down. I like these, nice and sturdy looking. People may laugh at my bean supports made of old scaffold poles and concrete reinforcing mesh, but they don’t ever collapse! They look perfect. Now I feel inspired to do something similar in my garden. Thank you!